The value of the Zoltan David Iris Pendant is about $56,000. Sir Zoltan David is truly one of the more innovative jewelry makers of today. With a focus on gemstones and intricate metal work, his pieces are genuinely wearable works of art. That may well be why the curators at the Smithsonian Institute have opted to include one of his pieces in a permanent collection there. It was in 2016 that Sir Zoltan David’s Iris necklace won the American Gem Trade Association’s Spectrum Award. It was this recognition that put the piece in front of the eyes of some of the most significant curators in the jewelry world, including those at the Smithsonian Institute. The group was enchanted by this unique moonstone pendant and consequently completed their multi-year search for the centerpiece of the moonstone collection in Smithsonian’s Feldspar Exhibit. The Iris necklace will be permanently installed as the highlight of the Moonstone Collection in early 2018. 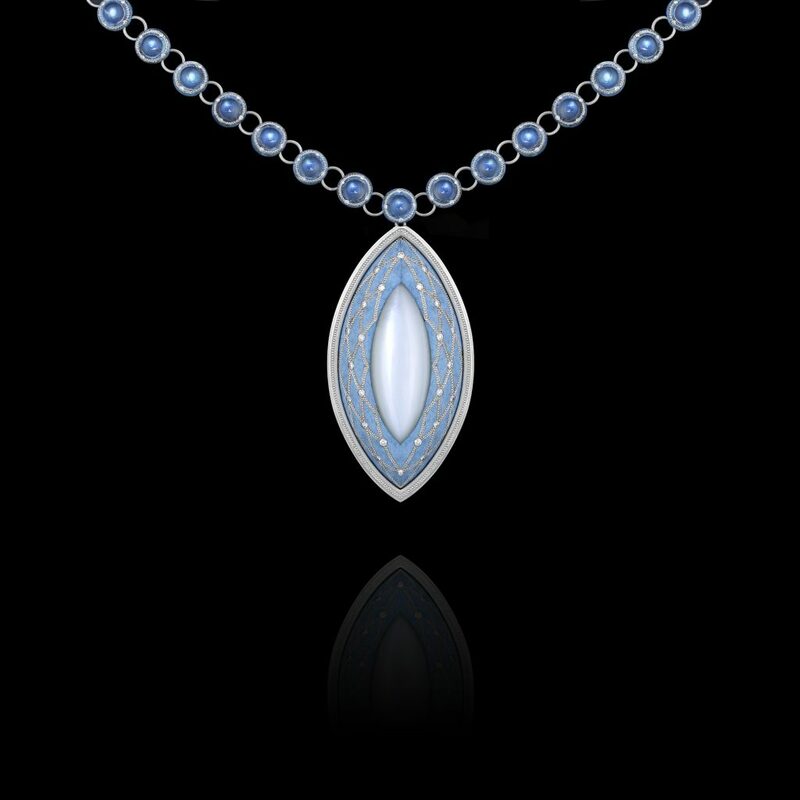 The centerpiece of this unique necklace is a shimmering 35.63 carat Cat’s Eye Marquise Cut Moonstone from India. Complimenting the pendant, are 35 individual gem quality moonstones in iridescent blue, which together weight over 18 carats. As the only Texas jeweler in history to receive such an honor, Sir Zoltan David describes it as a dream come true: “What an honor to have my Iris necklace showcased with some of the finest jewelry houses in the world. I am a proud small business owner who is truly living the American dream, and I am grateful now to be sharing my work with people from around the country and across the globe”. David states, “My curiosity and my authentic exploration of natural, previous materials have allowed me to create unprecedented advances in metallurgy. But at the end of the day, it is the beautiful piece of jewelry that will become the treasured heirloom. Iris is now America’s heirloom moonstone”. The Iris pendant, soon to be a permanent centerpiece in the Smithsonian Feldspar exhibit, is valued at $56,000. 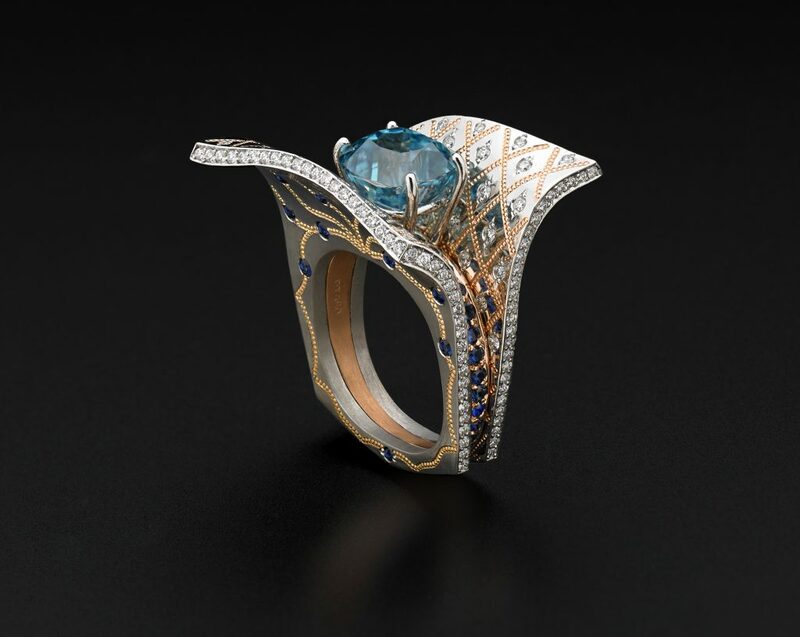 Fantasy’s flight is another of Zoltan David’s works of art.A longtime innovator in the craft of metallurgy, the enchanting stones are set in blue patinated bronze with pure platinum shaped inlay and ideal cut diamonds – a design unique to Zoltan David. Through a marriage of old world goldsmith techniques and 3-D laser metal printing, Zoltan David has created a distinctive, never before seen look. This authentic approach to the art of jewelry making is truly groundbreaking.